Basics for a Bargain: Black Pencil Skirts for Every Body Type & Budget! You know the old saying, “If you can’t stop thinking about it, buy it”? Well, that circulated in my head & heart all weekend… about a black pencil skirt. Mind you, I have a few black pencil skirts, all in different materials & cuts, but one particular caught my eye recently & I couldn’t stop thinking about the styling possibilities, especially for my next stylish photo shoot. It’s a staple for any Style Darling at any size, that’s for sure. This isn’t news in the fashion world. Magazines everywhere have been championing pencil skirts for every shape as a way to get the most out of a wardrobe without breaking the bank. Since I gave in to the “buy it” theory, I was simultaneously inspired to explore every which way a pencil skirt can enliven your style. Check out the A-listers below to get inspired by all kinds of black pencil skirts & style choices, including blogger / actress Jamie Chung, designer / author Lauren Conrad, Mad Men star Christina Hendricks, Aussie actress Rebel Wilson, the flawless Kerry Washington, & the one & only, Jennifer Lopez. Pencil skirts aren’t just for the office either. 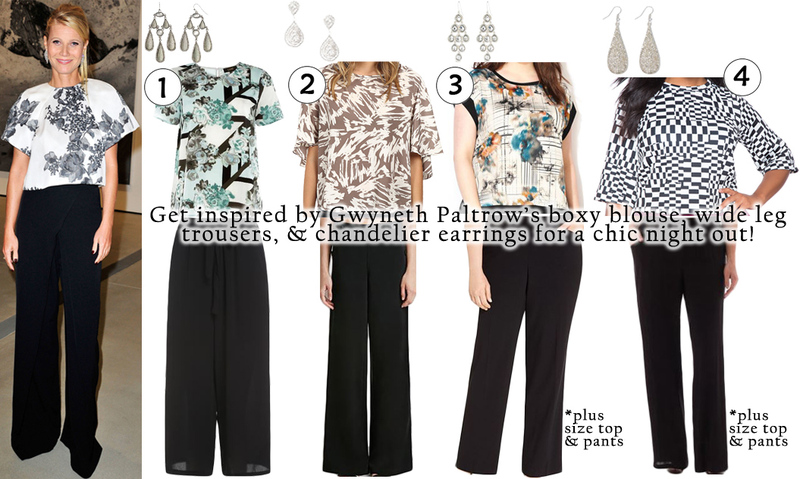 Mix up your pencil skirt look with a graphic tee, peplum top, button down shirt, turtleneck, or body suit, for example. 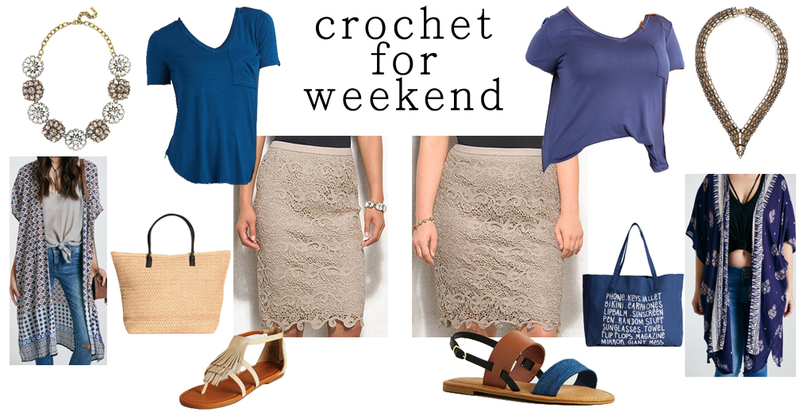 Wear one on a date night, going out with girl friends, or when running daily errands. The possibilities are endless for the basic bottom, especially if you’re looking to dress down something glitzy or elevate a casual top. Play with minimalism or menswear, perhaps even utilitarian or bombshell styles all when wearing a pencil skirt. SHOP: Misses cold shoulder top @Charlotte Russe, graphic tee @Nordstrom Rack, floral blouse @ModCloth, Plus plaid shirt @Forever 21, embellished top @Dress Barn, printed peplum top @Old Navy, & Petites ruffle tank @JCPenney, denim t-shirt @ASOS, & lace trim tank @Gap. 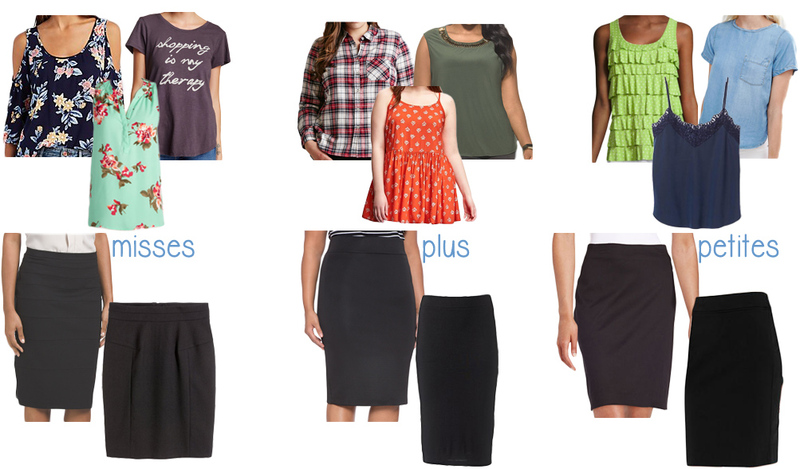 Misses skirt @TJMaxx & skirt @H&M, Plus skirt @Eloquii & skirt @Kohl’s, & Petites skirt @Lord & Taylor & skirt @The Limited. When it comes to the fitted skirt, look beyond a pump & to special details in your accessories. A black pencil skirt is a great foundation & neutral for any special extras, including playing with patterns, metallics, sparkle, cut-outs, & luxe textures. The suggestions below barely scrape the surface of what you can do with your ensemble, especially when you can wear a pencil skirt any season. 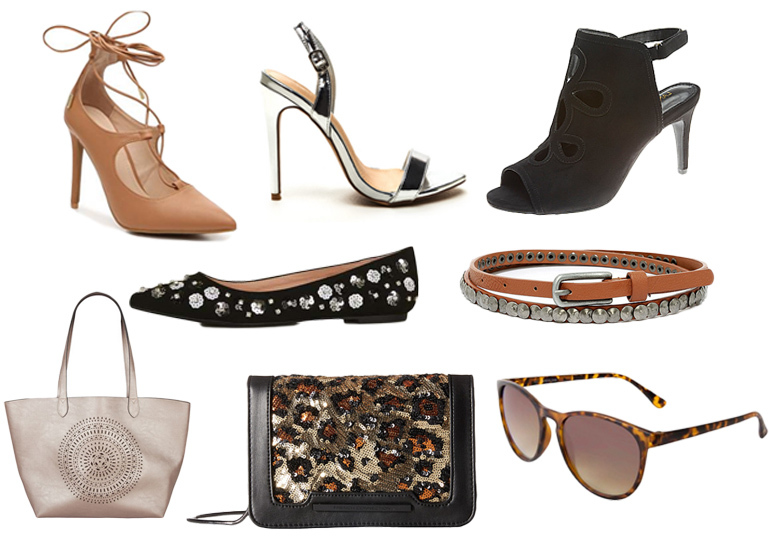 SHOP: ankle strap pumps @DSW, metallic heels @GOjane, ankle booties @Lane Bryant, embellished flats @Topshop, belt @Lulu’s, rose gold tote @Payless, leopard clutch @6PM, & tortoise sunglasses @Target. 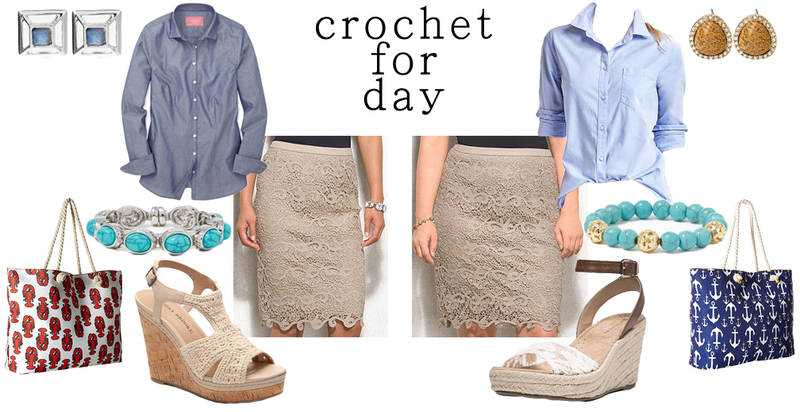 How would you style a pencil skirt? How often do you wear one? Where do you like to shop for staple wardrobe pieces? How much would you invest in season-to-season separates? Which celebrities inspire your everyday style? Happy Styling! 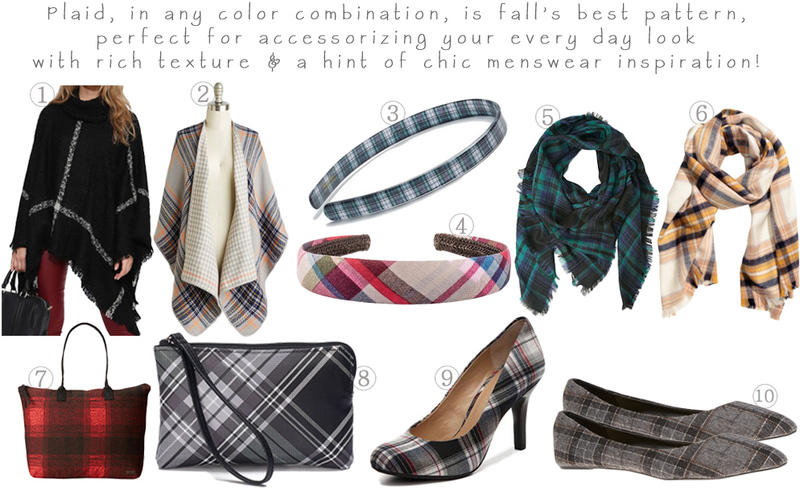 Accessories Access: Mad for Affordable Plaid Extras This Season! Plaid is the perfect print for fall, calling to match up your menswear style with sleek separates & luxe textures. Celebrities have been on the plaid train for a long time now, & it couldn’t look any better on the following A-listers: Reese Witherspoon, Jessica Alba, Taylor Swift, Rita Ora, & Hilary Duff. Easy ways to add some plaid to your wardrobe without breaking your budget is to invest in accessories to wear with a variety of looks. Plaid goes against classic staples like a button down shirt & skinny jeans, a sweater dress & knee boots, as well as a lace blouse with a pencil skirt. Anyone of any age can rock plaid, & here are some affordable accessories to get you inspired to build that street style-ready fall look. 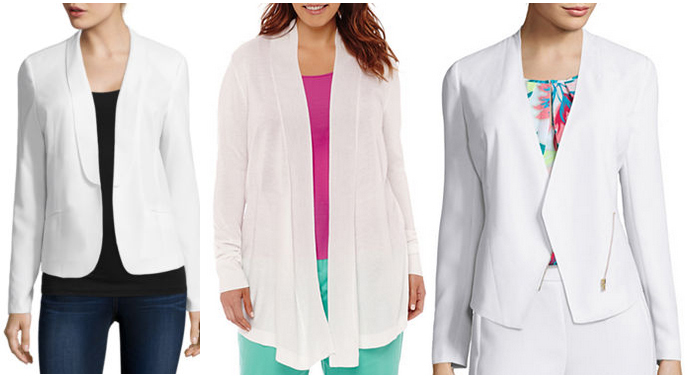 SHOP: 1. poncho ($37.99) in black / white @Necessary Clothing, 2. shawl ($39.99) in stone @ModCloth, 3. France Luxe headband ($20.00) in navy / green @Nordstrom, 4. Remington headband ($5.00) in red plaid @Target, 5. scarf ($12.90) in navy / green @Forever 21, 6. scarf ($12.99) in yellow checked @H&M, 7. Volcom pixie tote ($30.99, was $45.00) in red @6PM, 8. Croft & Barrow wristlet ($24.00) in black / white @Kohl’s, 9. 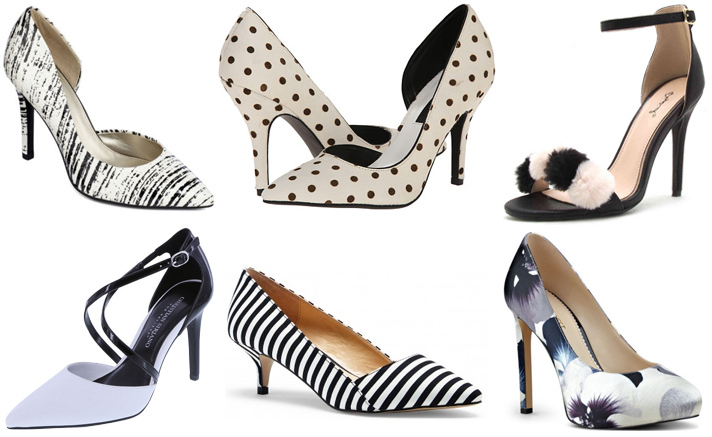 Kelly & Katie pump ($39.95) in multi @DSW, & 10. flats ($12.00) in black pattern @Wet Seal. When it comes to plaid, amp up your look with a little luxury, playing up your jewelry style based on the colors in your plaid. The richest colors include navy, green, burgundy, rust, burnt orange, gray, & purple, which are easy to find in stud earrings, decadent ear crawlers, statements necklaces, cuffs & bracelets, & cocktail rings. SHOP: 1. Helen Pavé square studs ($14.00) in navy @Francesca’s, 2. stone ear crawler ($7.99) in gray @Target, 3. faux stone cocktail ring ($6.90) in green @Forever 21, 4. enamel hinge bracelet ($20.96, was $29.95) in burgundy @The Limited, & 5. spirit beads necklace ($20.00) in light orange @Charming Charlie. 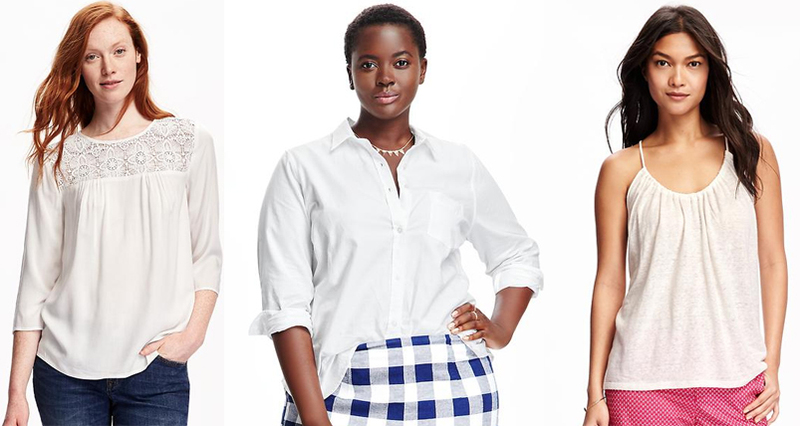 How do you like to wear plaid? 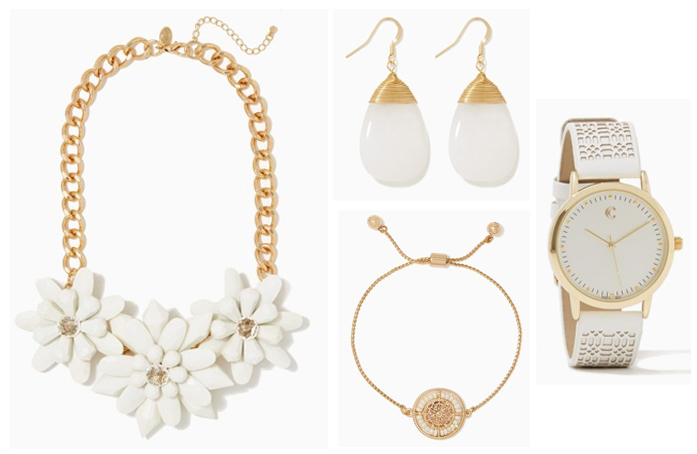 What’s your favorite accessories for fall? What jewelry do you find works best with plaid? For more posts, check out fall floral separates for every size, affordable capes & ponchos for any body type inspired by Gwen Stefani & Jamie Chung, Olivia Palermo’s new jewelry collection for Bauble Bar, & Sienna Miller’s three-piece menswear outfit for less. Happy Styling!